A Twitter handle is the username that appears at the end of your unique Twitter URL. A Twitter handle is not the same as a Twitter name. Twitter handles appear after the @ sign in your profile URL and it must be unique to your account. A Twitter name, on the other hand, is simply there to help people find the company they’re looking for. While choosing a Twitter handle may seem simple, there are 330 million monthly active users now on the platform. This means that finding the ideal handle on the first try isn’t as easy as it once was. Use your name: If you have a pre-established business or personal brand, use it. If users have already claimed your title, adding descriptors like “Inc,” or “HQ” may help. Avoid numbers and underscores: Twitter handles should be as simple and memorable as possible. Adding numbers and underscores makes your username more complex and harder for followers to find. Be consistent: Use the titles you embrace on other social channels. This will help with cross-promotion and make it easier for followers to track you. Don’t stuff your handle with keywords: It’s easy to get into the habit of putting keywords everywhere. Unfortunately, keywords in your Twitter handle sometimes look spammy. Keep it short and sweet: Twitter is all about short, instant-impact content. Keep your name small to avoid taking up too much of the character limit when people respond to you or retweet your content. 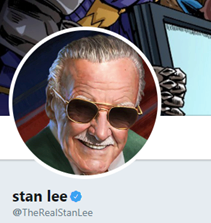 Be careful with “The Real”: If someone else has your ideal Twitter handle, consider using “The Real,” such as @TheRealStanLee. However, the number of fake accounts using this prefix means that it’s essential to verify your account if you want to stand out. With millions of users already active on Twitter, there’s a good chance someone else has your handle. If you can’t access your ideal handle, don’t panic. One option is to ask the person who owns your Twitter handle whether you can have it. Alternatively, if you have a trademark on your company name, issue a complaint with Twitter. Adding “HQ” or “Inc” to demonstrate your professionalism. Adding “The” to the front of your Twitter username. Referencing your industry. Many app developers use the word “app” at the end of their Twitter handle to make it unique. Adding terms like “Team” or “Community”, i.e. “SproutSocialTeam”.